High-Quality Durable Material to withstand the harsh conditions, you can rest easy knowing your TV is protected all year round against dust, insects, UV Rays, ice and condensation with a television cover. With High-Quality Mesh Fabric on the backside of the cover, to improve the breathability of the material while keeping out water, wind, and moisture. What this means is that mold and moisture do not build up underneath the cover due to the change in the ambient temperature or humidity. 100% UV resistant for any covering need. Mesh fabric at backside for breathability. Easy to use/ Perfect fit. Custom solution for any covering need. As a result, your TV is not damaged and rendered inoperative due to 'sweating'. A softer internal lining and a handy remote control pocket mean you have the ideal cover to enable your TV to be protected 365 days a year! Protect your television to ensure your equipment is ready to use at any time - in winter or summer! Best Custom Cover Solutions for Outdoor Patios, Fire Pits, TVs, Machines, and More. We take pride in making outdoor protective covers for virtually everything! COVERS & ALL - Your Trusted Brand with thousands of happy customer reviews on website is now on Amazon! 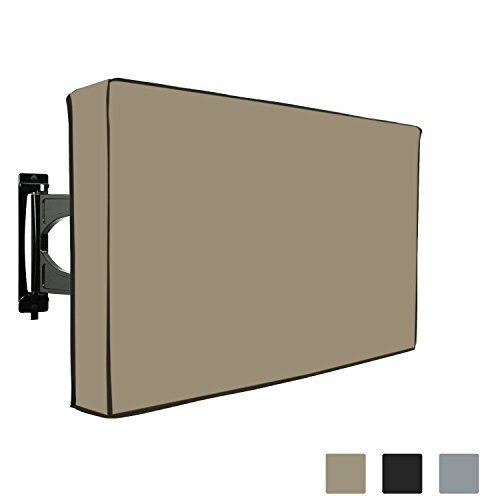 OUTDOOR TV COVER: Covers for all your outdoor furniture. Get covers and all patio chair cover for your patio furniture and protect it for a long time. All covers are coming with air vents for breathability to making them mold and mind. ALL WEATHER PROTECTION: It provides protection for your outdoor TV from rain, moisture, animals, snow, wind, sunlight, bird droppings. This TV cover is made with 1000 D, Both Side PVC Coated, Waterproof, Weather Proof Material. 100% UV resistant for any covering need. It Won't crack in cold weather even. BREATHABILITY: Cover has high-quality mesh fabric on the backside so that there is no condensation and for better breathability to making them mold and mind. This cover has remote pocket and 3 flaps and at back side to fit all type of wall and standard mounts. CUSTOM SIZE OPTION: We also provide custom size option for the covers if you want a cover of your size please visit over website and you can create all size and shape cover. Personalized your chair covers with your logo, name or text on it. Personalization using the latest UV printing technology. 3 YEARS PRODUCT WARRANTY: We provide covers with a 3-year manufacturer's warranty. Protect your entire patio furniture collection with Covers & All high-quality material covers. If you have any questions about this product by COVERS & ALL, contact us by completing and submitting the form below. If you are looking for a specif part number, please include it with your message.